It's always a little emotional and somewhat nerve wracking when you introduce your toddler to your favourite band. What if they hate it? Or ask you to turn it off? As a lifelong lover of The Beatles, happily their wacky ways, catchy melodies and ability to paint pictures with lyrics aided me enormously. There are so many to choose from: Yellow Submarine, Penny Lane, even later solo works such as McCartney's Frog Song. I can, however, think of few better songs for a toddler than Octopus's Garden and I was delighted to discover that it has now been captured in quality picture book form. With lyrics by Ringo Starr (obviously) and gorgeous illustrations by Ben Cort (who created the images for Alien's Love Underpants), this happy dream between a young boy and his tank-bound pet fish, has rapidly become a bedtime ritual and joined our repertoire of sleepy time songs. 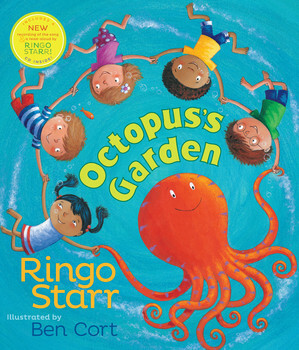 It also comes with a CD containing a new recording of the song by Ringo and narrated version of the book, which can be played alongside; great for independent little ones who like to do things themselves. Though the publishers recommend this book for 4-8 year olds, I'd say that it works brilliantly for my almost three year old, and even ten month old Culturetot finds it very engaging. Some of the pictures have been produced lengthways across the book and these in particular capture the real depths below the storm where the children are safely hiding. It's a cosy song, and the book with its deep and colourful palette and joyful characters echoes this haven where play can be free. Octopus's Garden was only the second of Ringo Starr's compositions for The Beatles and is included on the last album the Beatles recorded together - Abbey Road. Apparently Ringo got a bit fed up during the White Album sessions and took his family on holiday to Sardinia. A friend lent him a boat and the captain served Octopus for lunch. Whilst Ringo didn't partake of this cuisine, he was fascinated to hear that "...they go round the sea bed and pick up stones and shiny objects and build gardens. I thought "How fabulous! Cause at the time I just wanted to be under the sea too. I wanted to get out of it for a while."" (Ringo 1981). George Harrison worked on the song with Ringo when he returned, and Ringo even created the water sounds by blowing bubbles in a glass of water. It isn't difficult to see why such a song can conjure up halcyon dreams of childhood, and wrap its many limbs around a three year old's imagination. I love sharing this with the girls. Disclaimer: We requested a copy of this book for review from Simon and Schuster UK, which they kindly provided. We love it. Images are from Simon and Schuster's website. Sounds like a great book, some for the adults to recognise as well as children to get to know. N lves books with CDs - although I always forget where the CDs have been put.